Austin A40 Car Club of Australia Inc. – Where preservation, restoration and continued use of all Austin A40, and other Austin or BMC motor vehicle is our life. About the Austin A40 Car Club of Australia Inc. 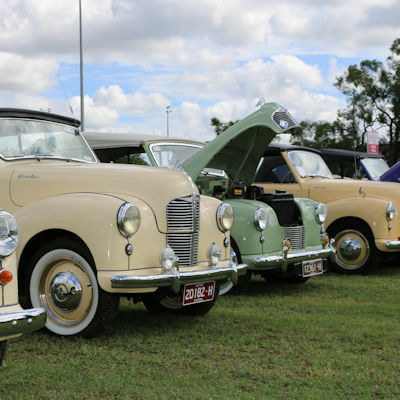 The Austin A40 Car Club of Australia Inc was formed in 1971, the main focus of the club being the preservation, restoration and continued use of all Austin A40 motor cars, and other Austin or BMC built Austins other than A40s. The club attracts a wide and varied group of people with many skills and attributes, who share the same passion of owning and driving Austin cars. Social events, club runs and meetings are held monthly. Bi yearly, on the odd year, members attend “Austins Over Australia” with other Austin enthusiasts from all over Australia and the world. The Austin A40 Car Club is a member of the Association of Motoring Clubs and the Federation of Veteran, Vintage & Classic Vehicle Clubs. These organisations help to keep the hobby car movement on the road by assisting clubs and working with governments at State and Federal Level. All rights reserved. No part of this website or publications from Austin A40 Car Club of Australia Inc. may be reproduced in any form without permission from the club Editor and/or the club Web Administrator and copyright holder. Any views expressed within are not necessary those of the Club or it’s Committee. Pictures on the website are the Copyright of Austin A40 Car Club of Australia Inc. unless stated otherwise. If you wish to use any of the images which appear on this website, please contact us for permission.